To be clinically diagnosed as hyperactive, a child must fidget frequently, leave his seat, run or climb excessively, have problems playing quietly, be constandy on the go, or be overly talkative. He blurts out answers before the question is completed, has trouble waiting in lines or taking turns, and interrupts or intrudes on others. Because these behaviors often describe the average preschooler, it’s very difficult to attach the label of hyperactive to a little whirling dervish. Clinical tests must be done for a proper diagnosis, but even these may not be definitive for preschoolers. 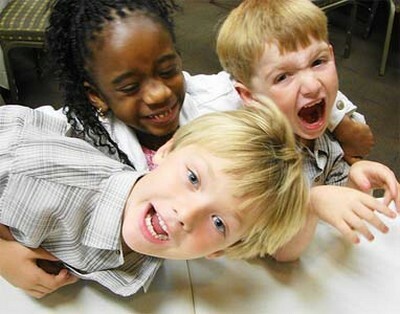 If you see four of the above symptoms in your child daily for at least six months, a professional trained in diagnosing hyperactivity can help you understand the difference between a “hyper” active child and a hyperactive child, and he or she can help you manage the behavior of both. Note: Hyperactivity is considered part of a larger disorder commonly referred to as Attention Deficit Hyperactivity Disorder (ADHD), which comes in three forms: ADHD, predominantly inattentive type; ADHD, predominantly hyperactive/impulsive type; and ADHD, predominantly combined type. All forms of ADHD are difficult to diagnose before children enter formal schooling at about age five, when they’re first required to sit and pay attention for longer periods of time, to work while remaining seated, and to memorize material that they’ll be tested on later. If your child regularly runs instead of walks and screams instead of talks, introduce calm activities to slow his breakneck speed. For example, play a quiet game, read to him, or have a tiptoe-and-whisper time to teach him that slow and calm is a refreshing change of pace. Watch your own activity level. Does hyperactivity run in families? Research has shown that when a parent is diagnosed with hyperactivity, it’s highly likely that his or her child will be, too. Look at your own life: Do you ever sit down? Do you talk fast? Is your pace always rushed? If you’re a high-energy, always-on-the-go person whose “hyper” activity doesn’t get in the way of your success and happiness, then your child may simply have your inborn temperament. Since young children are such great imitators, slowing down your activity level will show your preschooler how to savor the moment. When your child is in constant motion, his entertainment shouldn’t be. Wild and crazy television programs model behavior you don’t want him to emulate. Turn off the TV to turn off at least one source of noise and “hyper” activity you don’t need around the house. Instead, play quiet restful music and encourage TV with a softer tone. Give your child opportunities to practice walking – not running – from point A to point B. Say, “Show me how to walk from the kitchen to the family room. I know you can do it. When you walk instead of run, you keep yourself safe.” Gradually increase the number of practice walks to a maximum of ten each practice session. Provide a variety of activities. Born-to-be-busy children flit like summer houseflies from one activity to another and have trouble staying in one place. Give your “hyper” active child a cafeteria of choices by saying, “You can color on your drawing table, play with clay in the kitchen, or play with your building blocks. I’ll set the timer, and you can do one activity until the timer rings. Then you can choose something else if you want.” Providing many options lets your child fulfill his need to be busy without driving you to distraction. Your high-energy child needs constructive outlets in which to satisfy his need to be on the go. Let him run in the park or in your yard whenever you can, or make sure his preschool or daycare provider gives him some running time. Although it may be tempting to sign him up for the neighborhood sports team that all his buddies are on, beware of starting your preschooler too early in sports that can injure his growing body or cause him to burn out before he’s ten. Young children need the freedom to rev up their newly charged engines without being corralled in an organized, competitive setting. When your child learns to relax his body, his motor slows down and he feels less frantic. Help him avoid constantly pushing to do more, faster, sooner by keeping your voice soft and soothing, by rubbing his back, and by talking to him about how calm and relaxed his body feels. If your child’s “hyper” activity endangers his health, alienates others, and jeopardizes his learning, consult a trained professional to determine the cause of his above-average activity level. When your “hyper” active child accidentally collides with your most precious vase, take a deep breath and say, “I’m sorry you chose to run instead of walk. Now you have to practice walking in the house, so I’ll know you can do it. Then we’ll clean up the mess.” In this way, you reach your ultimate goals of teaching your child to walk instead of run, to respect property, and to be responsible for his actions. Your busy child needs daily opportunities to play in the great outdoors, so grounding him to the house or his room can cause two problems: (1) His “hyper” activity will swell to explosive levels, and (2) he will only learn to be hyper in the house instead of outside. Don’t rely on medication alone. Relying on medication alone won’t teach your child self-control. Get a thorough evaluation from a professional experienced in assessing “hyper” active children before you decide what behavioral tools and medication are necessary for your child’s well-being.